Free Shipping Included! Tea Kettle - Surgical Whistling Teapot with Capsule Bottom and Mirror Finish, 2.75 Quart Tea Pot - Stove Top Tea Maker Infuser Teapots Strainer Included (Single Handle) by Willow & Everett at Baking Love. MPN: 17. Hurry! Limited time offer. Offer valid only while supplies last. THE NICEST KETTLE YOU'VE EVER SEEN: You can feel it in the weight of the kettle: this 3 liter/100 ounce stove top kettle is built to last. Made with premium surgical grade stainless steel, Willow & Everett's durable and high quality whistling kettle can withstand rust, corrosion, dents, scratches and more. Its mirror finish is easy to keep clean and shiny and is an attractive addition and conversation starter to your kitchen. 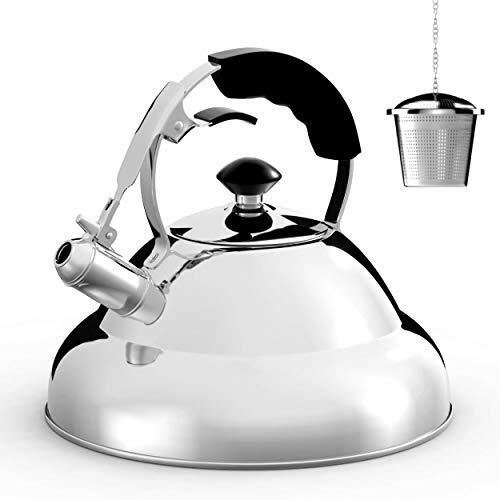 HEAT UP YOUR WATER IN NO TIME: Unlike other cheaper, lightweight tea kettles that use just one or two layers, this 3 liter tea kettle is made with FIVE layers of premium grade stainless steel, iron, and aluminum formed into a capsule bottom that heats up quickly and evenly. That means less waiting and a more efficient tea or coffee brewing experience for you! DESIGNED FOR SAFETY AND COMFORT: This stove top kettle was made with good design and functionality in mind. The handle and spout lever on the teapot are coated in non-slip, soft to the touch silicone that provides comfort, and protects your hand from the heat. The handle is ergonomically designed for optimal comfort and grip and the spring-loaded lever easily opens and closes the spout. DON'T PUT TOXIC CHEMICALS IN YOUR BODY: The Willow & Everett stove top kettle is 100% teflon and BPA-free and is made strictly of high quality stainless steel, iron and aluminum. Don't take the health risk of buying something you use so frequently that is tainted with hidden chemicals and questionable materials. We offer a 90 day money-back guarantee. If you're not completely satisfied with your purchase contact us and we'll make it right.